The small intestine is an organ located in the gastrointestinal tract, between the stomach and the large intestine. It is, on average, 23ft long and is comprised of three structural parts; the duodenum, jejunum and ileum. Functionally, the small intestine is chiefly involved in the digestion and absorption of nutrients. It receives pancreatic secretions and bile through the hepatopancreatic duct which aid with its functions. 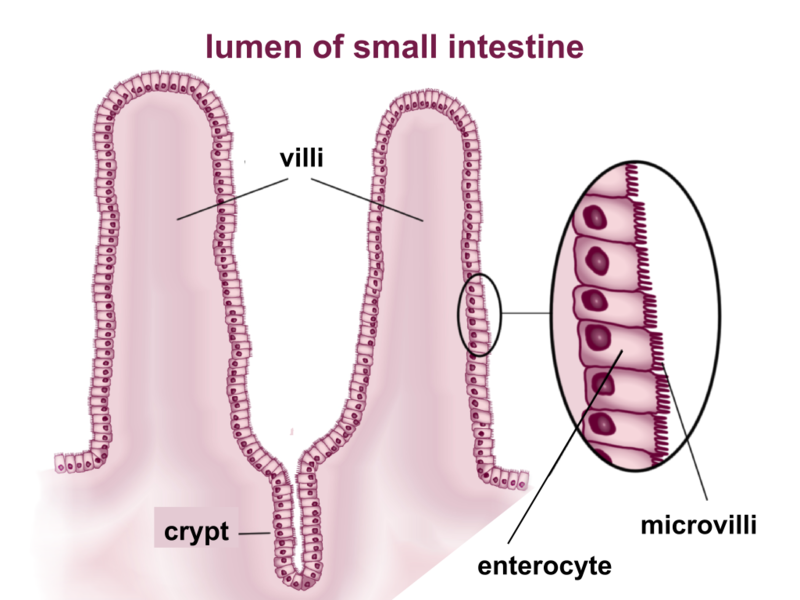 In this article, we will discuss the histology, structure and secretions of the small intestine. For a recap of the anatomy of the small intestine, click here. Mucosa (Innermost layer) – Contains the epithelium, lamina propria and muscularis mucosae. Submucosa – Connective tissue layer, which contains blood vessels, lymphatics and the submucosal plexus. Muscularis externa – Consists of two smooth muscle layers; the outer longitudinal layer and inner circular layer. The myenteric plexus lies between them. Adventitia (Outermost layer) – Comprised of loosely arranged fibroblasts and collagen, with the vessels and nerves passing through it. The majority of the small intestine adventitia is covered by mesothelium and is commonly called the serosa. The small intestine is the major absorptive site in the gastrointestinal tract, and therefore has a number of modifications to aid its function. The mucosa and submucosa form large numbers of folds (or plicae) arranged in a circular fashion in the lumen (therefore called plicae circulares). Additionally, the plicae contain microvilli to further increase the surface area, which increases absorption. Enterocytes – Tall columnar cells, which have an absorptive function. They contain brush border enzymes on the surface which have an important digestive function. Goblet cells – Exocrine glands which secrete mucin. The Crypts of Lieberkuhn are glands found in the epithelial lining. They contain numerous cells such as stem cells to produce new cells to replenish the cells lost due to abrasion, as well as enteroendocrine cells to synthesise and secrete hormones. To protect from pathogens, there are Paneth cells which secrete protective agents (such as defensins and lyzozymes) and Peyer’s patches which are only found in the ilium. Peyer’s patches contain mucosal-associated lymphatic tissue (MALT) which house white blood cells and lymphocytes. These cells can produce antibodies to further protect the small intestine from infection. Fig 1 – The ultrastructure of the small intestine. The enteroendocrine cells are located within the Crypts of Lieberkuhn. They secrete hormones in response to various stimuli. There are four main classes of enteroendocrine cell, each with a different secretory product. These are I cells, S cells, K cells and enterochromaffin cells. I Cells secrete Cholecystokinin (CCK) in response to the presence of fat in the small intestine. 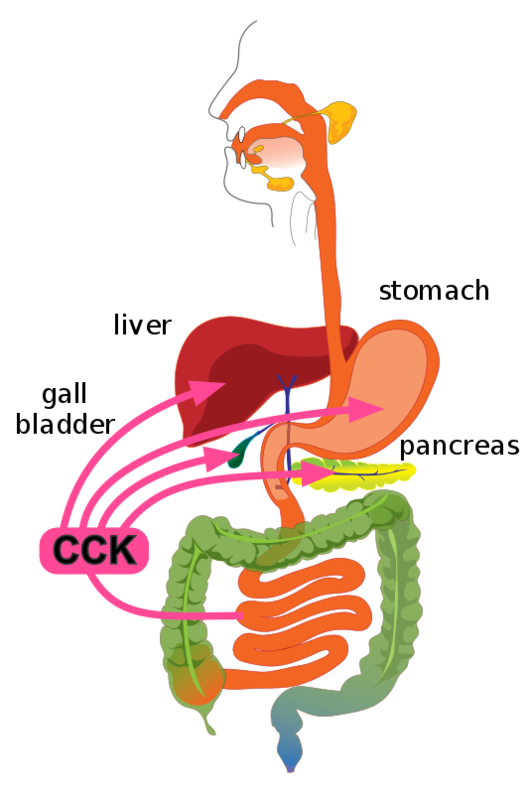 CCK stimulates the contraction of the gallbladder (which pushes bile out into the cystic duct) and the release of pancreatic enzymes. Both bile and pancreatic enzymes have a key role in lipid digestion. S Cells secrete Secretin in response to the low pH of chyme in the small intestine. Secretin induces HCO3– secretion from the pancreas and inhibits gastric emptying. Fig 2 – The target organs of CCK. K Cells secrete Gastric-Inhibitory Peptide (GIP), in response to chyme entering the small intestine. GIP has a misleading name as it actually stimulates insulin release, ready to put the newly digested carbohydrates into cells for storage. Finally, Enterochromaffin Cells are mechanically stimulated by the presence of chyme in the small intestine. They release serotonin, which acts on the enteric nervous system to activate the cystic fibrosis transmembrane regulators (CFTR). This ion channel secretes Cl– ions into the intestinal lumen, with Na+ ions and H2O following. Na+ is required in the lumen for the absorption of a number of nutrients. The small intestine receives secretory products from other abdominal viscera. Here, we shall look at the exact mechanism of their secretion, and how they aid intestinal function. There are three main substances that the small intestine receives: bile, pancreatic enzymes and alkaline juice (HCO3–). Bile serves an important role in lipid digestion, and is secreted from the gallbladder into the common bile duct, in response to CCK. Pancreatic enzymes and alkaline juice are secreted from the pancreas into the pancreatic duct, in response to CCK and secretin. Further information on the production of bile can be found here. 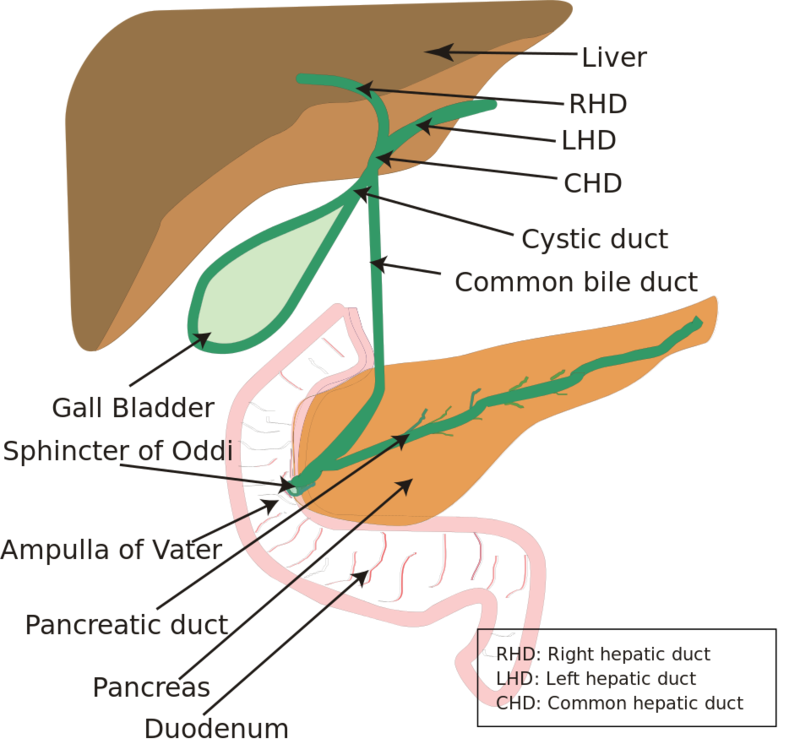 The common bile duct and pancreatic duct unite to form the hepatopancreatic ampulla (also known as the Ampulla of Vater). This opens out onto the internal surface of the duodenum, and is marked by the major duodenal papilla. The major duodenal papilla serves as an important anatomical landmark, as it is where the embryonic foregut becomes midgut. The secretions into the small intestine are regulated by the sphincter of Oddi. Fig 3 – The biliary system with the landmarks. The pancreas plays an important role in digestion, as it produces many of the enzymes needed in digestion. These enzymes come in two forms. Some enzymes are already active, such as pancreatic lipase and pancreatic amylase, whilst some are secreted as inactive enzymes such as trypsinogen. The inactive enzymes are released as zymogens (precursors of the active form) – this prevent the enzymes digesting the pancreas itself. Trypsinogen is converted to trypsin (active form) in the small intestine by coming into contact with the brush border enzyme enterokinase. Trypsin then converts the remaining inactive proteases to their active form. Further information on the exocrine pancreas can be found here. Coeliac disease is a condition which causes inflammation of the small intestine. It is autoimmune in aetiology, and affects roughly 1 in 100 people. The immune-mediated damage of the small intestine occurs secondary to gluten exposure. When gluten is absorbed, it is broken down into a number of products. One product is gliadin, a protein. In coeliac disease, gliadin is presented to the T cells of the immune system as a foreign antigen. This stimulates the production of antibodies against gliadin and an inflammatory response to occur. Fig 4 – Image showing massive lymphocyte infiltration in Coeliac disease. In children, clinical features include abdominal distension, diarrhoea and a failure to thrive. Adults present with chronic diarrhoea and bloating. Small blisters can appear on the skin (dermatitis hepatiformis) due to deposits of IgA. Adults may also present with symptoms of malabsorption. Serology and biopsy are the two main investigations for coeliac disease. Antibodies against gliadin and its other products can be found in the plasma. 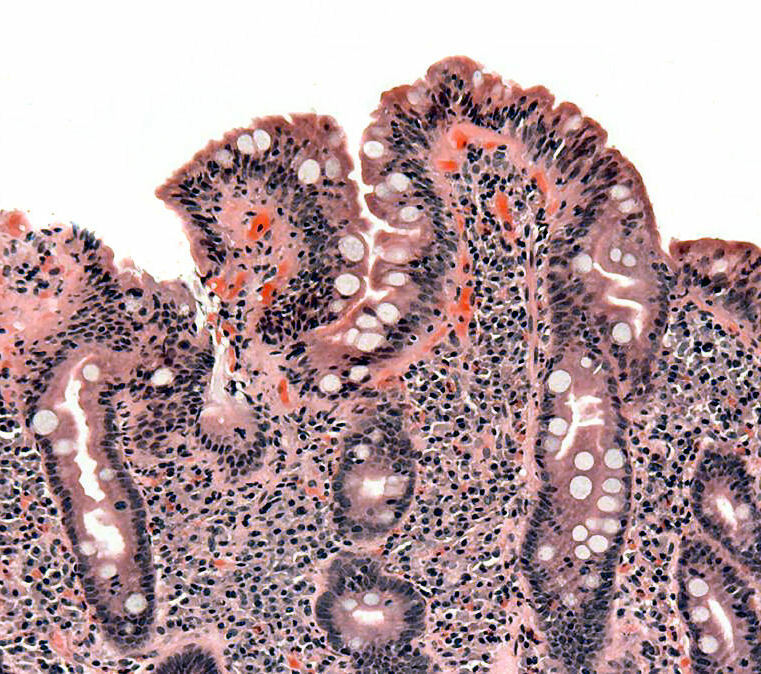 A biopsy of the small intestine shows flattening of the villi and hyperplasia of the crypts, with an increased number of intraepithelial lymphocytes present. The treatment for coeliac disease is a gluten-free diet. Which of the following is not an anatomical section of the small intestine? Which cellular adaptation do enterocyte cells possess? Which part of the duodenum does the Ampulla of Vater open into? Which cells is cholecystokinin released from?